So I went to see a few bands played last night. Two were from Sweden, but the best (performance-wise), I thought was Nico Vega, from Los Angeles, California. They're a three-piece band that sounds kind of like a thrash/rap/hard rock band, but what really impressed me was Aja's bold leotard outfit. You can't tell from the photo, but she's also barefoot. Apparently this is the common attire, looking at their myspace photos. Anyway, they sort of reminded me of The White Stripes, only because they're a guitar/drums combo. Plus this song "Man Must Dance" sounds uncannily like the 'Stripes. Finally, the Shout Out Louds came on stage. I can't fault the band for this, but there were a few annoying fans ones singing out loud, or should I say "shout out loud" the lyrics to their favorite songs. 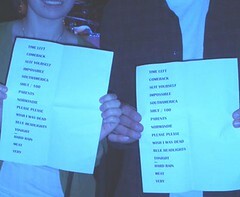 You can always tell which songs were the new/obscure songs whenever those fans shut up. On CD, Adam's vocals sounds like Robert Smith (The Cure), but when he's singing live, it just sounds very whiny. I thought it was annoying, but obviously I'm the only one that thought this because judging from the audience cheers and sing-a-along, no one noticed or cared. There was one song that the keyboard/accordion player stepped in to sing, which was a pleasant change. 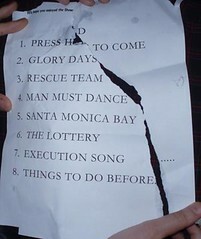 Special thanks to Michelle, who provided all the setlists.